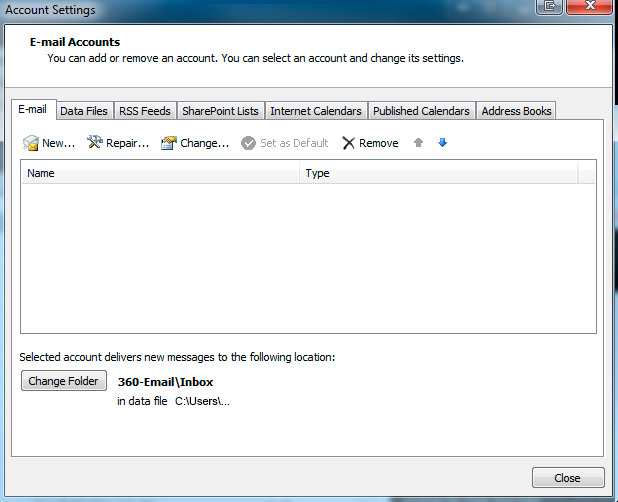 Sydney Webwise | Sydney Webwise | How do I set up my email accounts in Microsoft Outlook 2010? How do I set up my email accounts in Microsoft Outlook 2010? 22 Jan How do I set up my email accounts in Microsoft Outlook 2010? Instructions for setting up 360South standard emails in Outlook 2010. Note: Other versions of Outlook may use a slightly different process/order but the general settings will be the same. Open Outlook 2010 and click on the “File” tab in the top left. Click on “Account Settings” and open the Accounts options window. Under the email tab, click on “New”. Select “E-mail Account”, then Next. Select “Manually configure server settings or additional server types”. New outlook data file: delivers to a new inbox within Outlook. Existing outlook data file: delivers mail to your existing inbox within Outlook. Then click on “More Settings”. Name the account for your own reference. Use SSL for both incoming and outgoing servers. Delivery: Uncheck “Leave a copy of messages on the server”. This function can be handled directly in Gmail. Click on OK and then Next. Outlook will run a test. Wait for it to finish and click Close then Finish.